We are the exclusive representation for the Czech and Slovak Republics of patented technology of electric grills Greenplate with sophisticated design. Using ceramic elements reflecting the thermal energy directly on the heated surface leads to minimal heat loss and increasing efficiency of electricity. 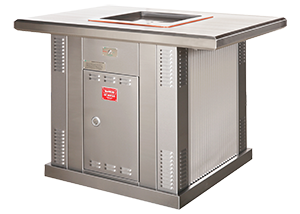 These eco-friendly grills have an integrated drainage effluents into the container and they can be controlled very easily. By the touch of a single button! Grilling surface is made of the technology of single-rolling campaign of high strength stainless steel which guarantees high resistance to scratching. This makes the surface of the grill in the long term remains smooth with minimal clinging dirt. If you do not choose from our range of available alternatives, please contact us and we will propose you a customised solutions directly to you. Our design office is capable to design a grill that meet your visual needs in a very short time. The grill is controlled with a single button with a child safety lock. Button is pressed for 6 seconds and then starts the automatic heating to fixed temperature. After the process is automatically switched off. The grill plates are placed at a safe distance of 20 cm from the edge of the grill. 230 V/50 Hz/1800 Watt/7.8, and for one of the grill unit.